For our full day in Porto, I was originally planning a day trip to the Douro Valley to do a sailing wine tour with Anima Durius tour group. 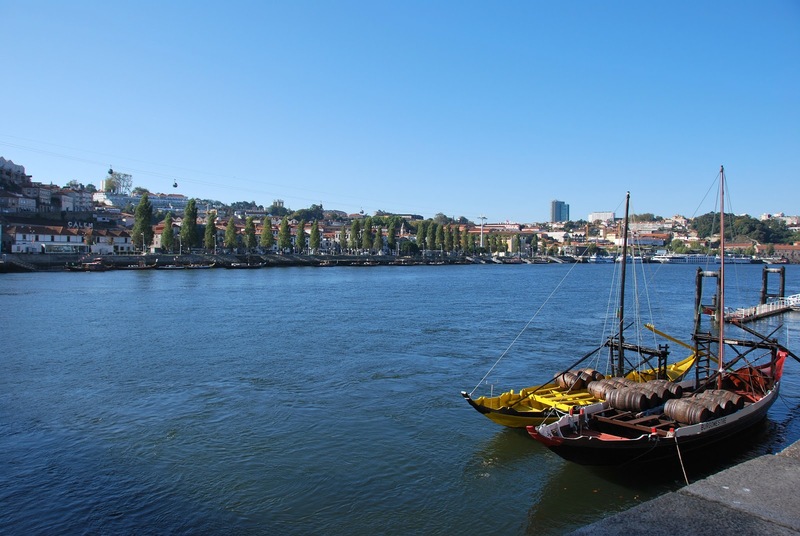 Unfortunately, they were not sailing the day that we would be in Porto, so we'll have to save that for another trip! 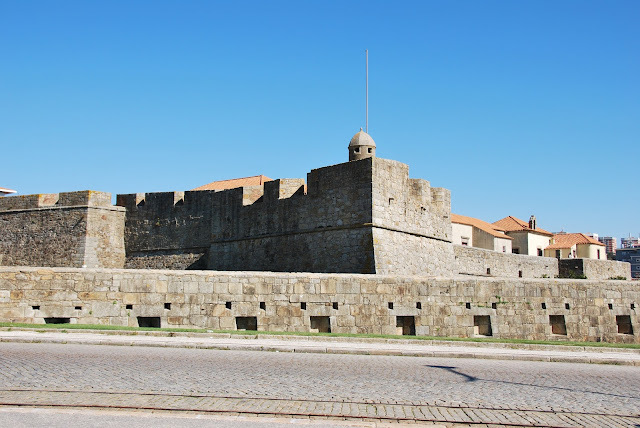 Instead, we started our day out by walking from our hotel down to the Praça da Ribeira, and then walking across the lower level of the Ponte Luís I bridge to the south side of the river. TRAVEL TIP: Porto's Ponte Luis I has a lower level and an upper level - pedestrians can cross both while cars use the lower level and trams use the upper level. Just be aware - the upper level is about 60 meters high, and you can often see through the metal structure all the way down to the river below! 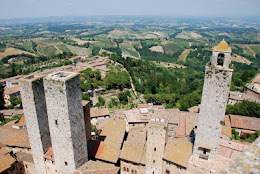 It's not the best for people with a fear of heights! 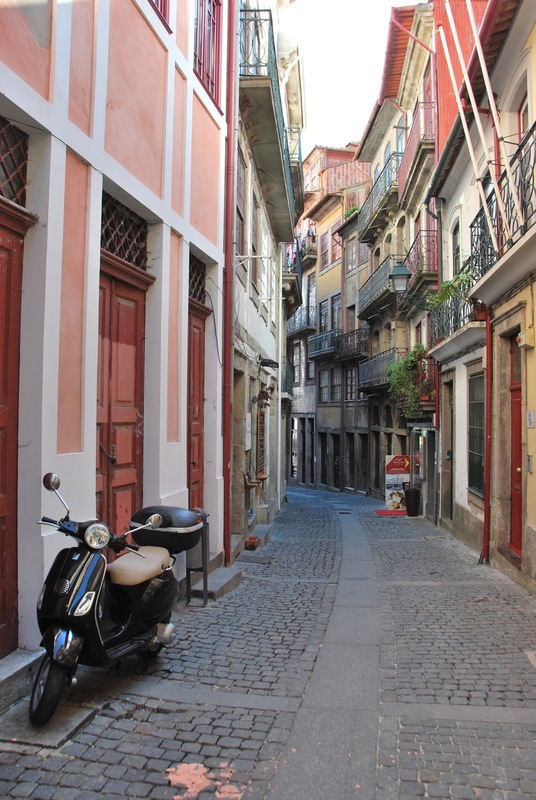 Small street by the river front. 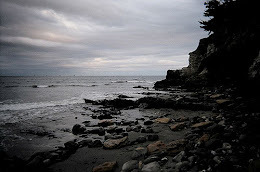 Looking south from the riverfront. 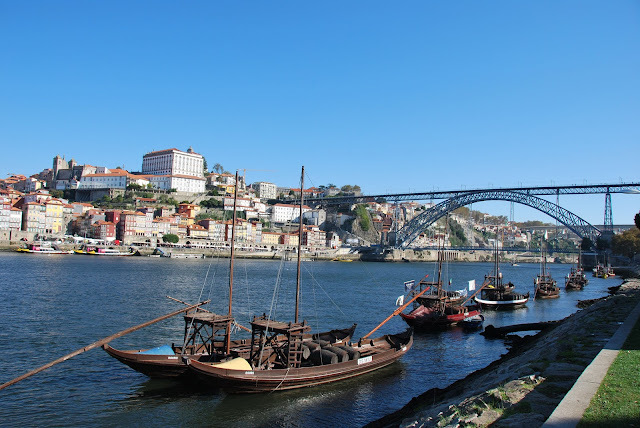 There were a ton of boats from the port houses that offered river tours - we wanted to take one, but wanted to do the "sunset" tour in the evening, so we decided to spend the day wandering Porto instead. Port house boats that tour the river. 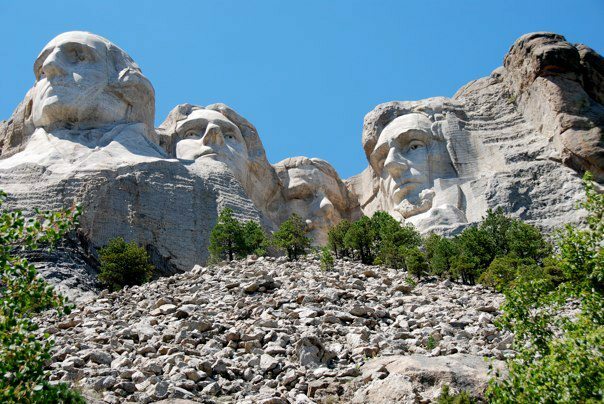 We bought tickets for the "hop on hop off" bus, and it was a great way to see the city. 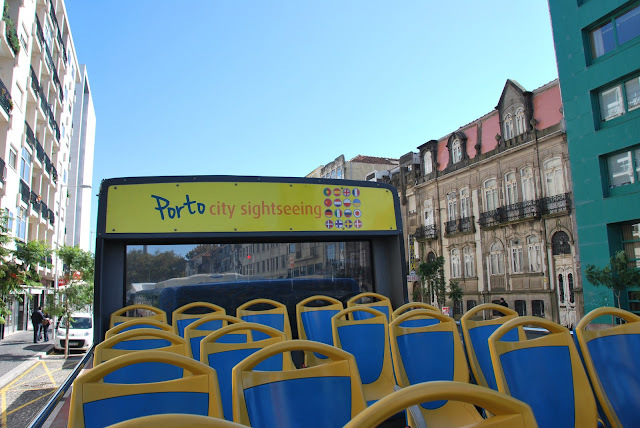 Porto is a VERY hilly city, so the bus made it easy to see a lot of the city, river, and port. There are a couple of options for bus tours in Porto, and we ended up using the Blue Bus City Tour. It cost €10 for a 24 hour pass, which included a port tasting at a local cellar! 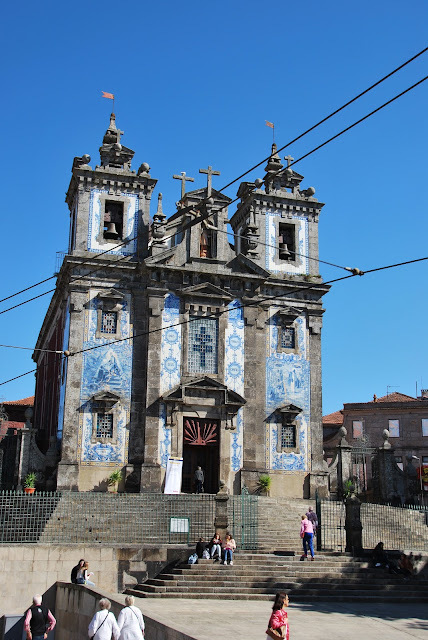 We boarded on the south side of the river, then went up through Porto to the Clerigos Tower, by the government buildings and Sao Bento Train Station, then out towards the Atlantic coast and the mouth of the Douro river. 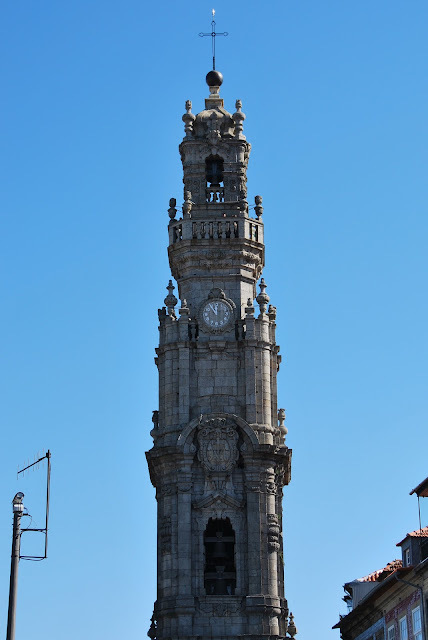 Avenida dos Aliados, with the Porto City Hall at the right. 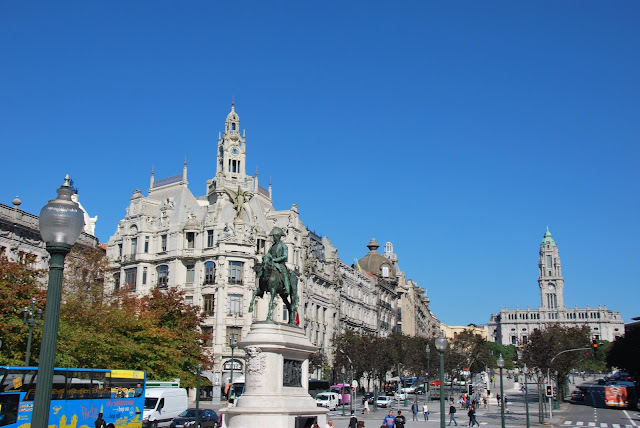 TRAVEL TIP: On our Blue Bus tour, the Avenida dos Aliados seemed to be the best place to pick up the bus! 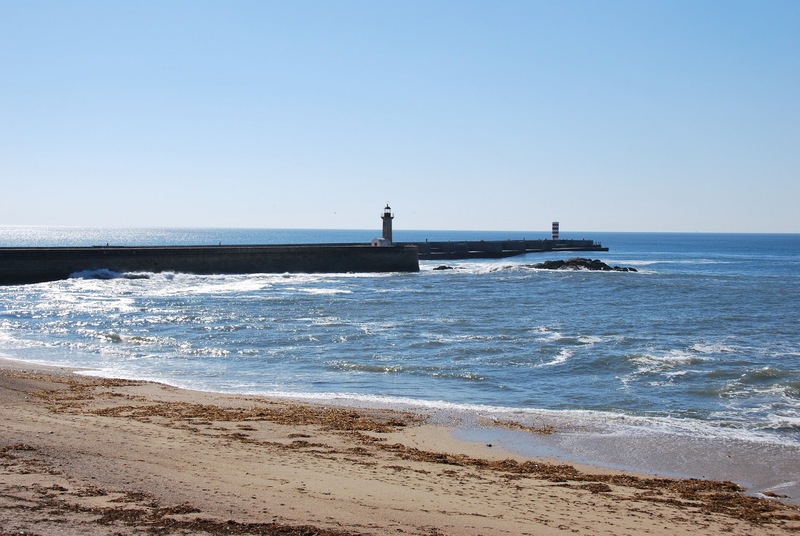 Lighthouses where the mouth of the Douro river meets the Atlantic Ocean. From one of the stops near Foz do Douro, we hopped off the bus and walked along the coast, and around the point heading back towards Porto on the riverfront. We stopped for lunch at a hole-in-the-wall bar that was using a charcoal grill in the narrow alley between buildings to cook up fresh sardines and squid. 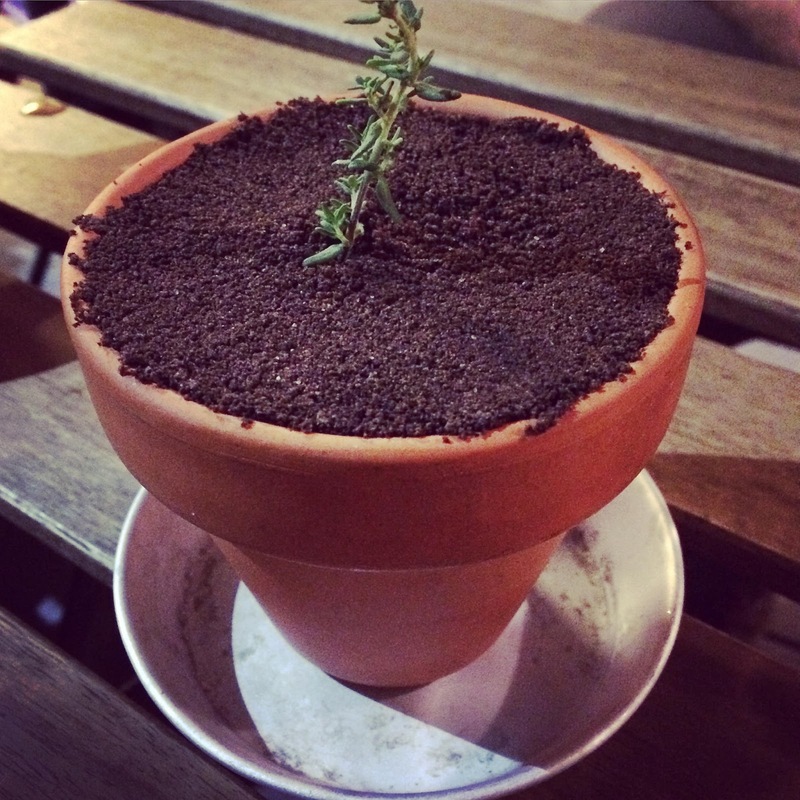 They only had two options on the menu and didn't speak English, and it was one of the best meals we had on our trip! We kept seeing a bridge in the distance, and not knowing any better, thought it was the Ponte Luís I bridge. In fact, it was actually the Ponte da Arrábida bridge... so our walk back to Porto took us quite a while. 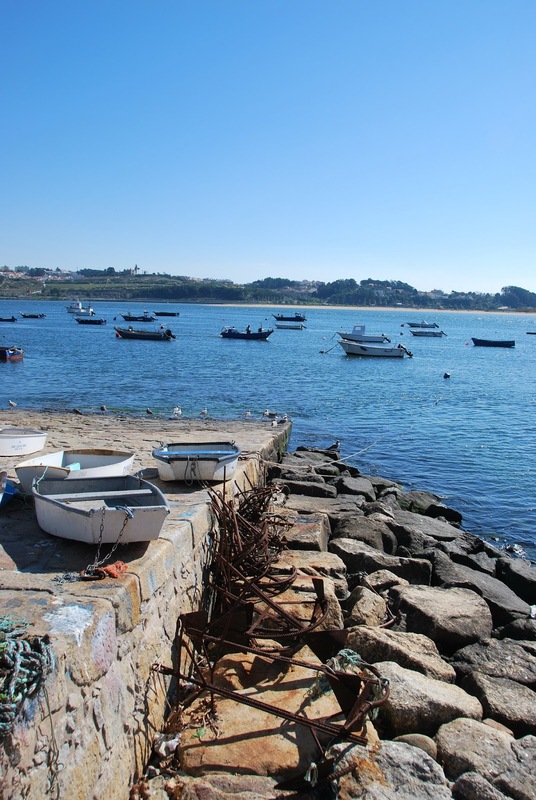 TRAVEL TIP: The mouth of the river at the Atlantic ocean is about 6km from the center of Porto. It took us almost two and a half hours to get back (including our lunch stop), but it was a lovely, flat walk with views the whole way back! Boats and anchors waiting to be used. 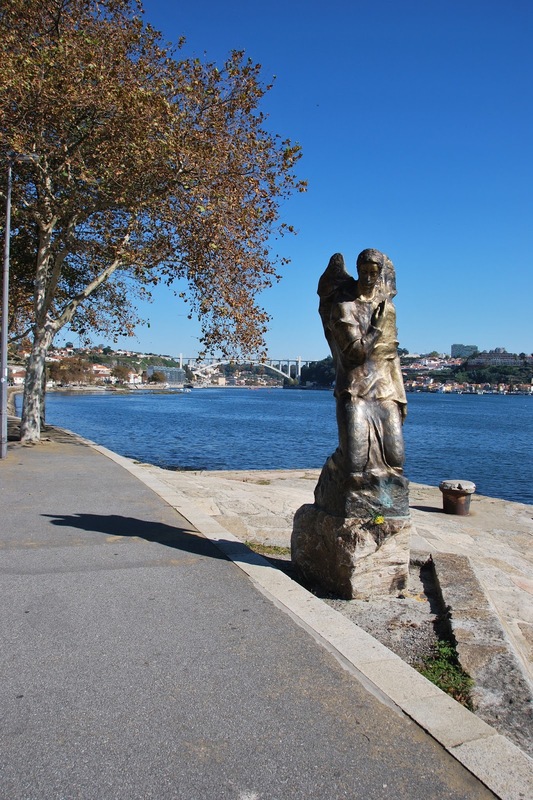 A statue on the river walk and Ponte da Arrábida in the background. 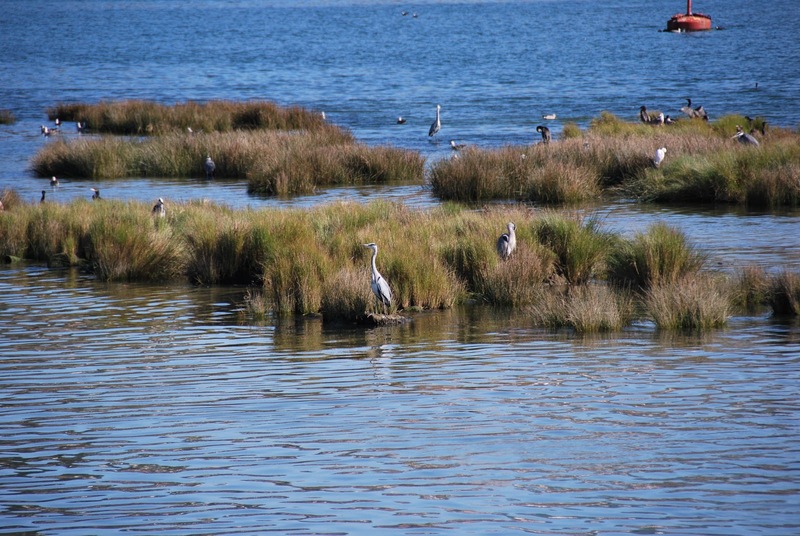 A small marshy area where all kinds of birds were roosting. 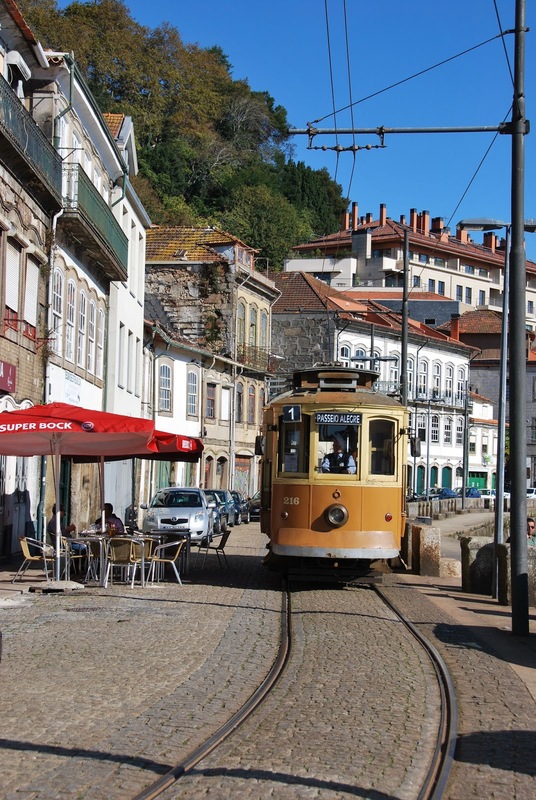 We were definitely wishing this cable car was going towards Porto instead of away from it by the time we saw it! 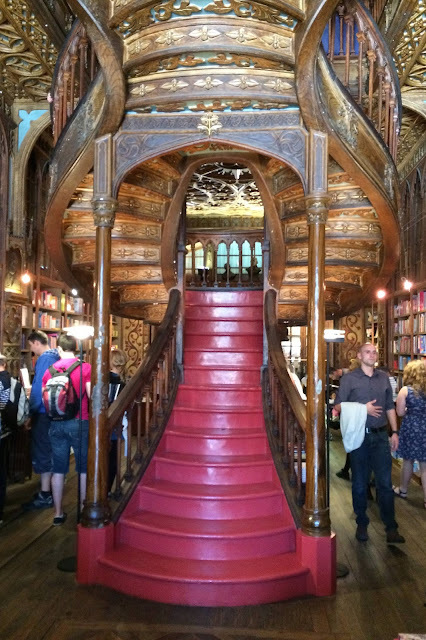 We finally made it back to a Blue Bus pickup spot, and took the bus up the hills of Porto so that we could find the famous Livraria Lello! 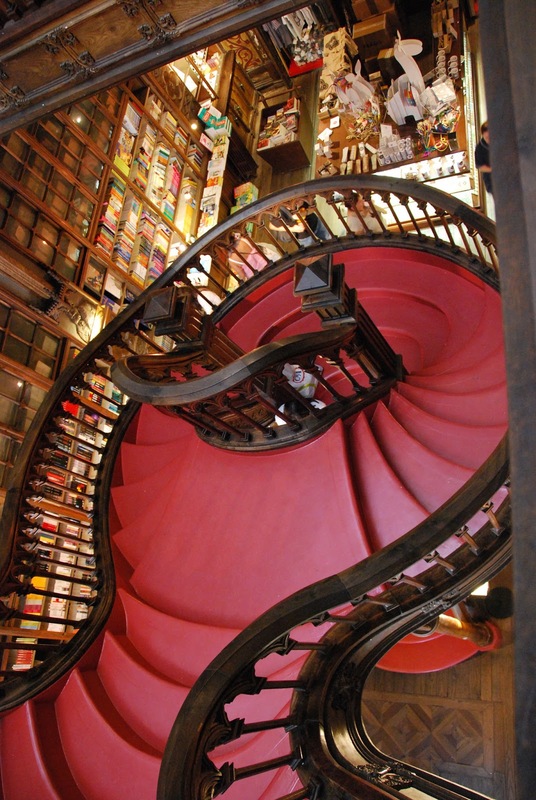 The rumor is that it's the bookstore that inspired J.K. Rowling to write Harry Potter, and it an amazing space. It cost €5 to enter, but then you have a €5 credit towards a book. I bought a lovely book about the Douro area of Portugal. 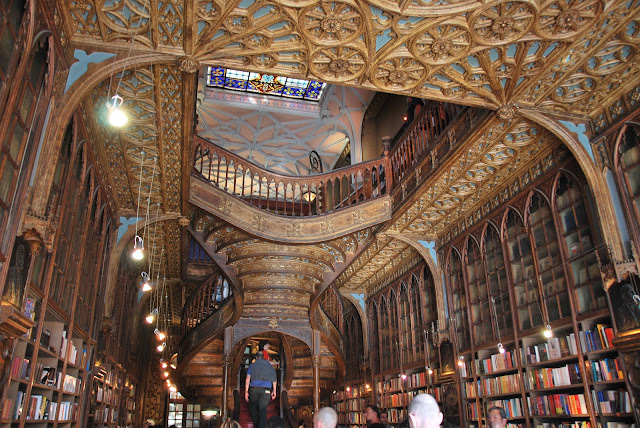 The architecture and detail of the bookstore is incredible, and it's absolutely worth a visit if you love books, bookstores, or libraries. Or Harry Potter! 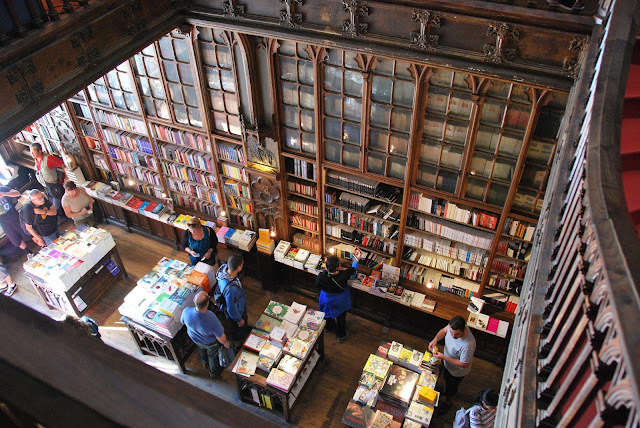 After the bookstore, we wandered some more, did a little shopping, and ended up back on the south side of the river. 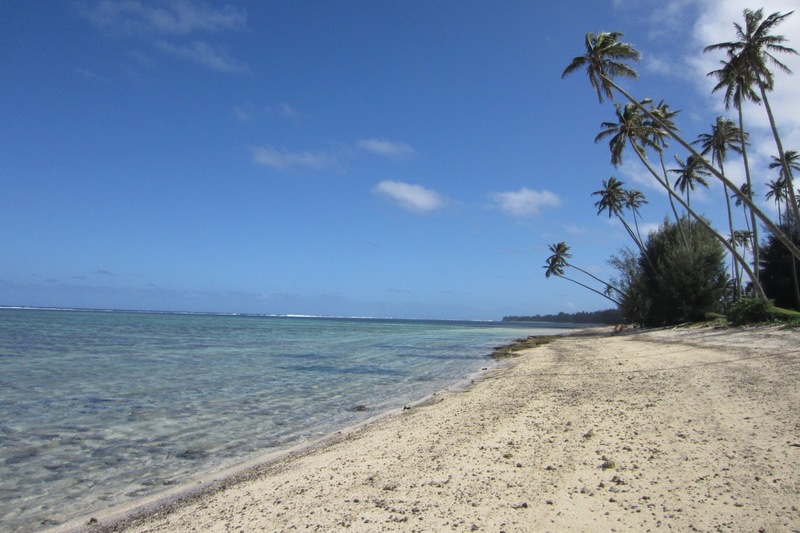 We had (quite unfortunately!) missed the last port house boat tours, so instead we opted for a quick cable car ride. 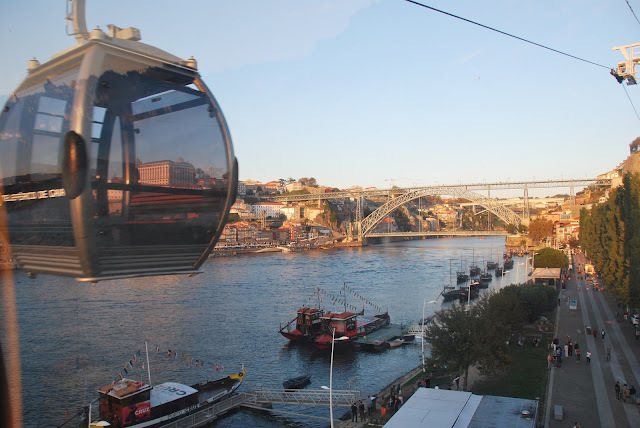 The cable cars go from the riverside up to the top of the Ponte Luís I, where you get fantastic views of Porto and the river! Church with a blue tiled facade. 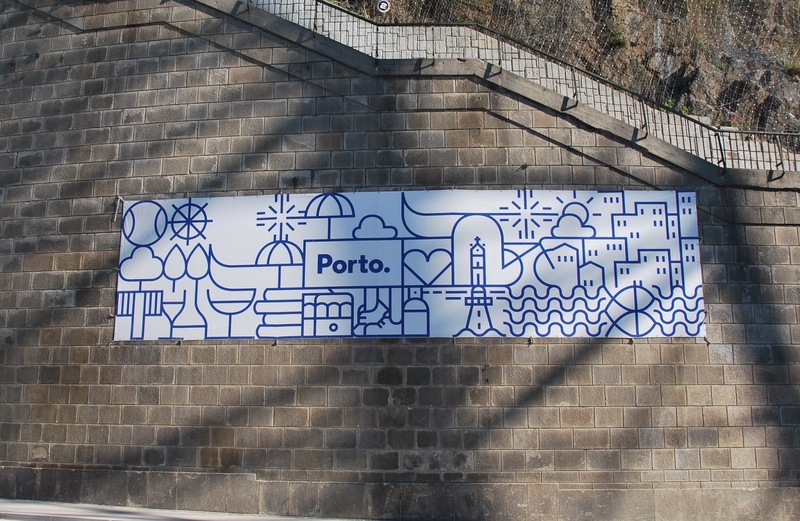 Porto sign at the base of the Ponte Luis I. View of the Ponte Luis I and the river from our cable car. We caught the final bits of the sunset from the bridge and the Porto Cathedral, then took a winding footpath back down to the riverfront. 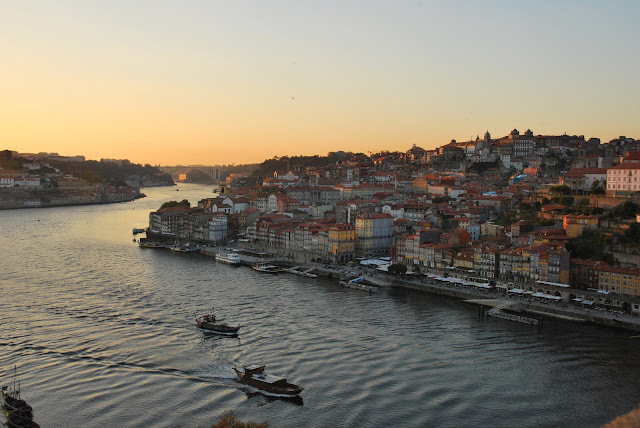 Sunset view of Porto from the upper deck of the Ponte Luis I. 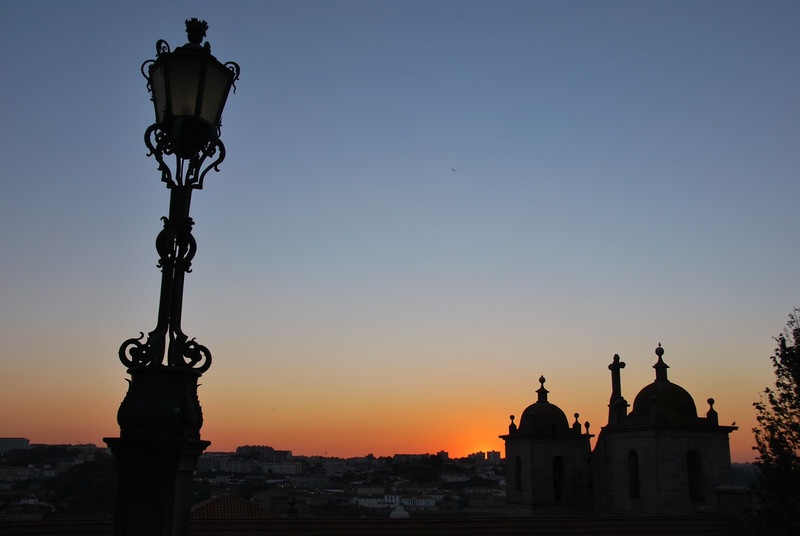 Final moments of sunset from the Porto Cathedral. It had been an insanely long day of walking and sightseeing, so we were exhausted by the time we walked back to our hotel. 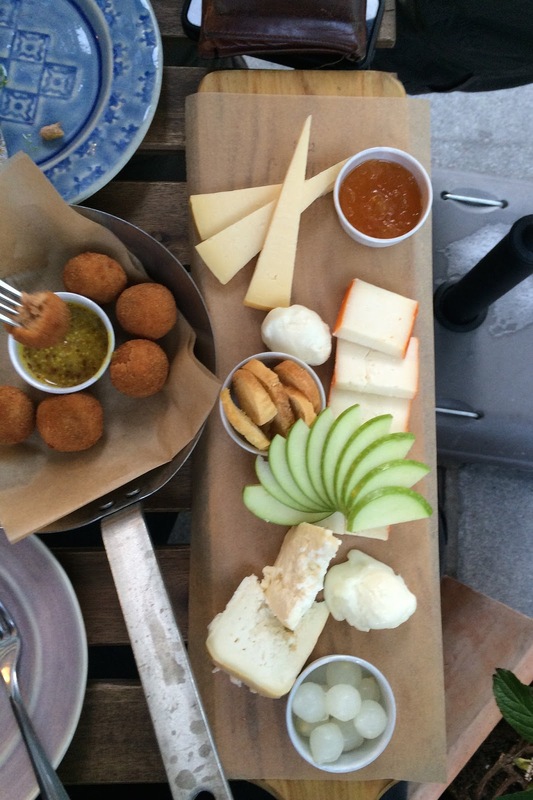 We went back to Cantina 32 for another cheese plate and more lupini beans, and this time added a bottle of vinho verde wine, followed by some delicious coffees and banana cheesecake in a little pot! Banana cheesecake at Cantina 32! 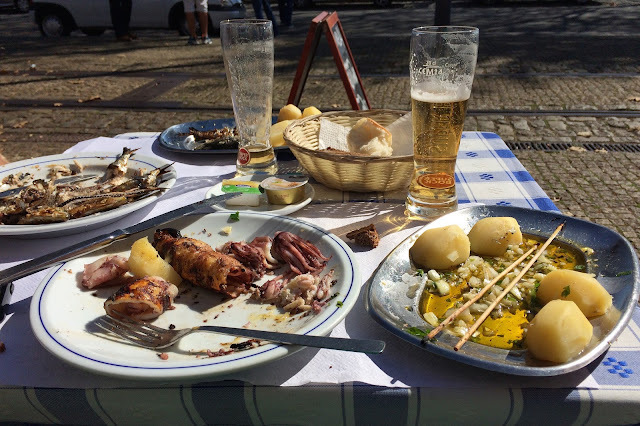 We really enjoyed our taste of Porto. 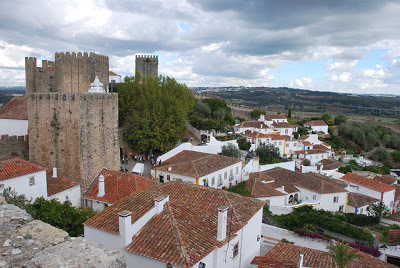 Next time, we would like to spend a lot more time there, so that we can really explore the north west area of Portugal and get out to the river for a cruise! Read more Portugal posts HERE!